Somali Orphans Charity Umul-Qura is a charitable organization catering to the needs of impoverished Somali orphan children. We are a UK registered charity established in 2008. The charity is founded by Somali women responding to the ongoing humanitarian crises in Somalia, specifically to meet the needs of orphaned children. 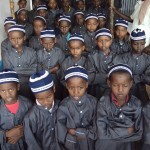 Sponsor orphans and maintain their physical and spiritual upbringing. 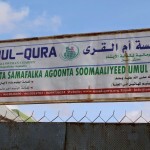 Somali Orphan Charity: Umul Qura is dedicated to ensuring that orphaned children in Somalia are given basic amenities in terms of food, shelter, education and equal opportunity and that they are given the opportunity to live happy and healthy lives. Enlarge the current school building and build a boarding school for boys and girls up to age. Extend the education program to include full primary and secondary level education. Increase the number of subjects that are taught in the schools including vocational training. To educate the children so that they embrace peace and become adverse to violence. Build a small health clinic that will treat minor illness and accidents. Review funding strategy to identify how the current funding system could be expanded and identify possibly future recourses of income. Increase the amount of food, shelter provision, and educational entitlement of the orphaned. Opened in August 2010 in Mogadishu, Somalia in the KM13 district. Opened boarding school for young boys and girls. teaching mainstream education in sciences and maths. Introduced Intermediate School in mid 2013. Open Secondary School with full academic subjects taught. computer science, software and design. Increase and improve educational resources. teaching skills, gain professional qualifications and improve teaching quality. Better Education Resources – books, computers, projectors, printers and paper. Technical skills resources – Electronics, ICT and computers. Completion of a Well for safe and clean water. Solar Panels – difficult to get lighting in our area. Build Schools – Primary and Secondary Schools. Improve and provide more teacher training on classroom management, teaching skills, gain professional qualifications and improve teaching quality.